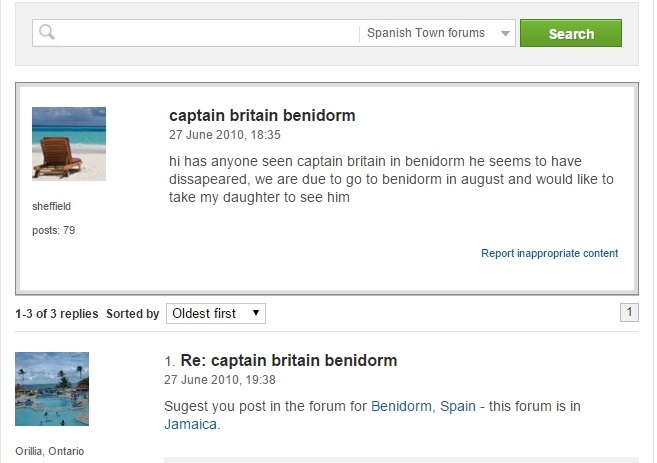 Captain Britain | The Captain Britain fans' page and blog. Did you know that in 1978 Captain Britain appeared at Wimbledon or as it was known then Wimbleton? 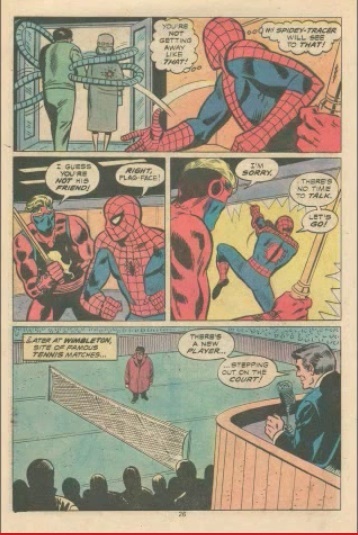 Did you know that at the hallowed tennis club he joined Spider-Man in a tennis match against Dr Octopus? No? Well all of this happened in Spidey Super Stories issue 32, let me tell you about it. 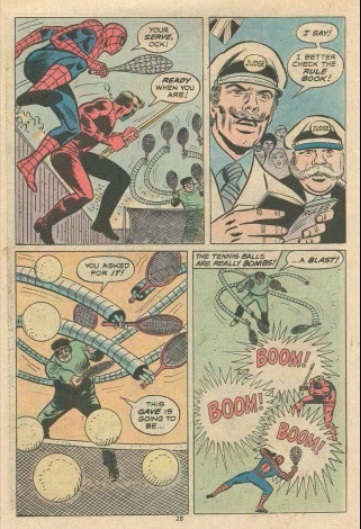 Started in the Seventies Spidey Super Stories was a comic spin-off from the TV show of the same name. Issue 32 saw Spidey team up with Captain Britain in a rather topical adventure set at the Wimbledon/Wimbleton tennis tournament. For those who like the facts this story was written by Jim Salicrup and penciled by Win Mortimer, it was published in March 1978. Please enjoy the story as it appeared so many years ago below, apologies for the quality of the scans they are taken from YouTube. 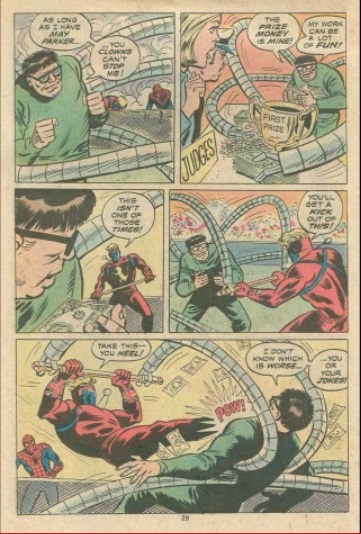 Cap attempts to foil a heist by Doc Ock. You have got to love those old fashioned bank bags full of coins, so impractical. Spidey in London for various reasons joins in, only for there to be the usual mix up. 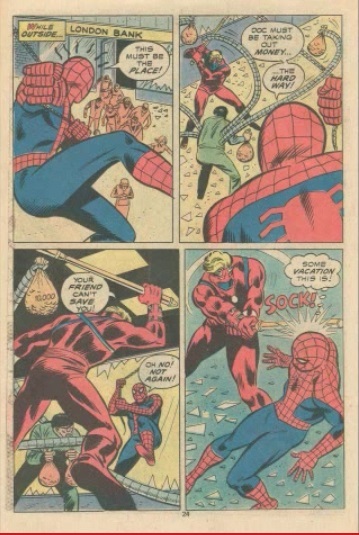 I love the last panel here with the “SOCK” as Cap brains Spidey. 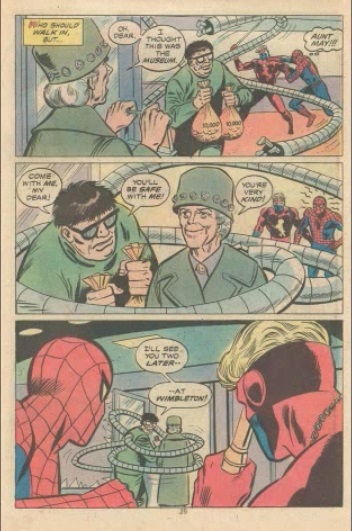 Aunt May is dragged into the fight as Doc Ock uses her as a hostage to get to Wimbledon/ Wimbleton. At no time is it explained why Aunt May has a flower pot on her head but moving on. Cap and Spidey team up and head after him, despite the petty name calling. Flag face indeed! 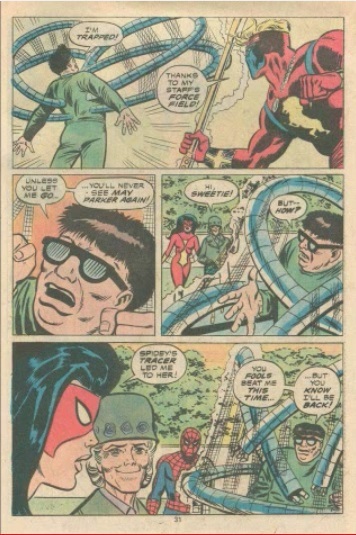 Doc Ock shows he’s certainly not going to play fair. Armed with a web bat and staff Captain Britain and Spidey challenge Doc Ock. Gotta love those super mustaches on the Wimbleton judges. 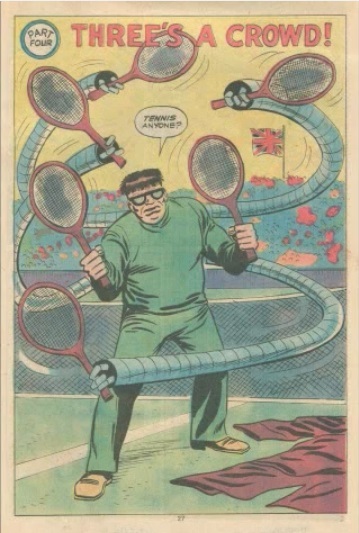 And Doc Ock reveals his true motives, stealing the Wimbledon/Wimbleton prize money. Luckily with a combination of web and force field Cap and Spidey stop the nefarious villain. I’m for once lost for words, this one-off story is so mad and marvelous in its insanity. 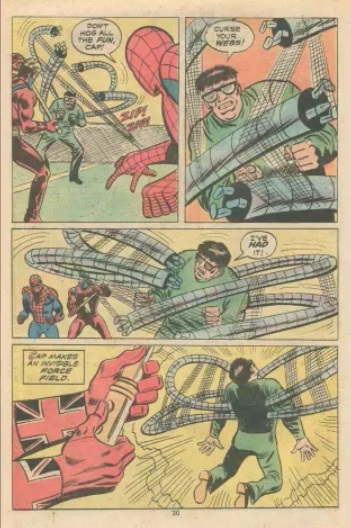 I love the idea that Captain Britain appeared at Wimbledon/Wimbleton, I love the idea Doc Ock is good at tennis simply because he has so many arms and I love the fact Cap uses his brains and force field to capture the Doc. I’m not sure why Wimbledon is renamed Wimbleton, I mean it was only in 1977 that Cap faced off against the Queen and Marvel didn’t see fit to change anything then so why Wimbledon’s name was altered is beyond me? Apparently I’m informed this isn’t Cap’s only appearance in Spidey Super Stories and I have an eBay order out for another wild tale. If your interested in this series why not check out Robin Barnard and his talented friends excellent parodies of these comics on Facebook. Check it out here. The Captain Britain news round up for June 2015. Will we see a new series soon? Welcome to a new feature for the Captain Britain fans’ page and blog, a news and views round-up of all things Cap, for June 2015. Will we see a new Captain Britain series after Secret Wars? Just why was the Contest of Champions so crazy? Read on and find out. So we started the month with some bad news from Cap, as he was expunged from a Marvel Universe poster. Read more about the now you see him and now you don’t Captain Britain here. Meanwhile after a center stage performance in Secret Wars issue two, Cap and the Braddock family get glossed over in issue 3. But Meggan branches out. Read about Cap’s off panel cameo and Meggan in A-Force here. Over on Facebook Cap voiced his displeasure at the start of another week. Luckily it wasn’t all bad, kick back with a look at some classic Cap action from 1982 when he appeared in the Contest of Champions. Read about how Cap for once found himself paired with some marvel A-listers here. Over on Facebook we covered current Captain Britain and the Mighty Defender’s writer Al Ewing’s favorite heroes. Your monthly ahhhh factor is delivered via this picture of pint size Cap and Meggan. You’re welcome. Ever wondered why Captain Britain and Dr Doom don’t get on? Administer a mighty Stplanng and click here to read more. Why not take a look at my Top 5 favorite Captain Britain custom action figures. Click here to see the surprise number one. Good news for digital comics fans as more Cap content comes to Comixology. We end the month on some interesting news, a rumour that there will be a Captain Britain ongoing series after Secret Wars. So I hope you found that news and views round-up useful. Let me know what you think, do the fancy Facebook inserts work and how it could be improved in the comments below. Is this why Captain Britain and Dr Doom don’t get on in Secret Wars? As another week of Secret Wars comics comes and goes without Captain Britain I decided to re-read some old issues of Excalibur looking for interesting stories to post about. What I came across was a story that I think goes a long way to explaining why Captain Britain and Dr Doom don’t get on in Secret Wars. Read my comments on Secret Wars 2 here if you need to bring yourself up to speed with the changes to Captain Britain first, else please continue. 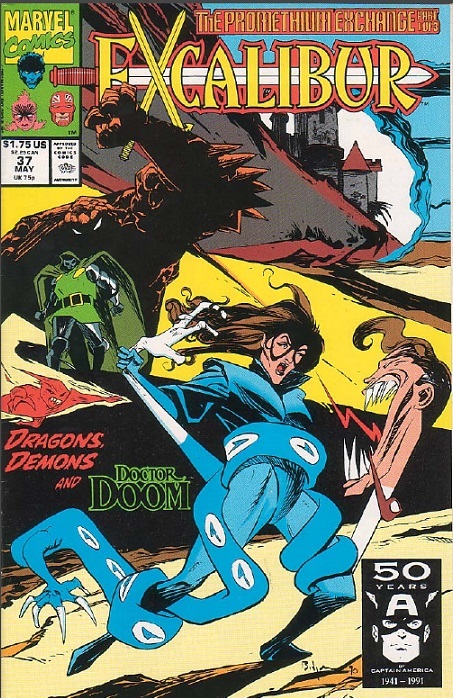 The action takes place in Excalibur issue 37 from 1991, Scott Lobdell handled the script while Mark Badger provided the art. Here’s the cover. As you can see insanity awaits within as Dr Doom manages to trick Kitty Pryde into allowing him into the realm of Limbo where he wants to harvest the power of Promethium for his own nefarious aims. All pretty standard super hero fare but this comic does cover a marvelous fight between Captain Britain and Dr Doom which lifts the story above what you might have expected to read. Realizing Dr Doom is up to no good Cap squares off against him despite Dr Doom believing himself safe. 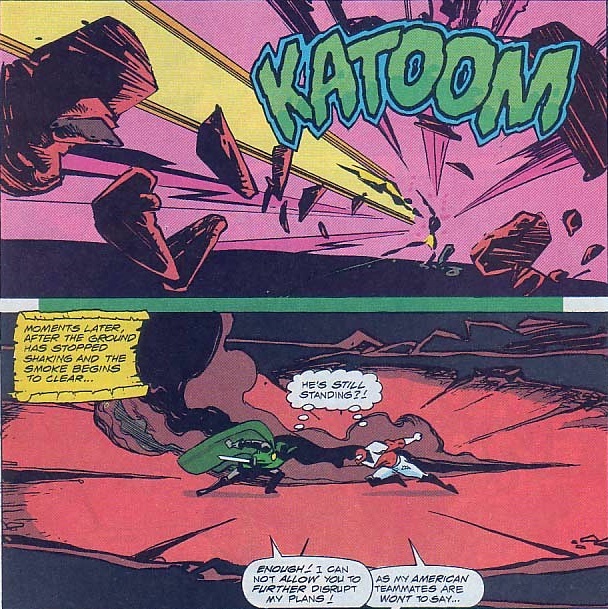 Captain Britain using his mighty arm and brain deals Doom an unexpected blow, but just how much power can Cap muster? 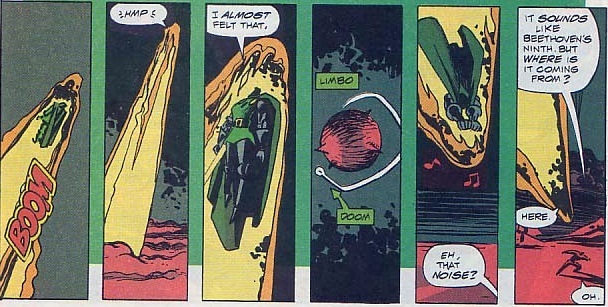 Quite a lot it seems as he punches Doom into orbit around Limbo, though Doom being Doom is unimpressed, in spite of the sonic boom. 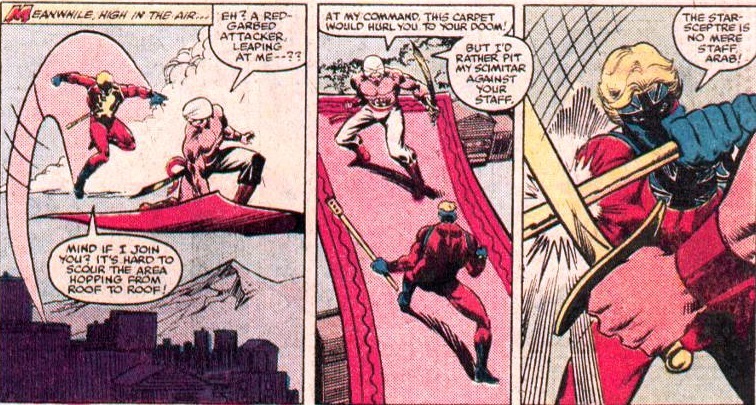 But Doom even with his seeming indifference seems to harbor a modicum of respect for Cap and his power. So there we have a fine example of Captain Britain using his mighty mind and superb strength and making an impression on one of Marvel’s most arrogant foes, which is something even Reed Richards has had difficulty doing. 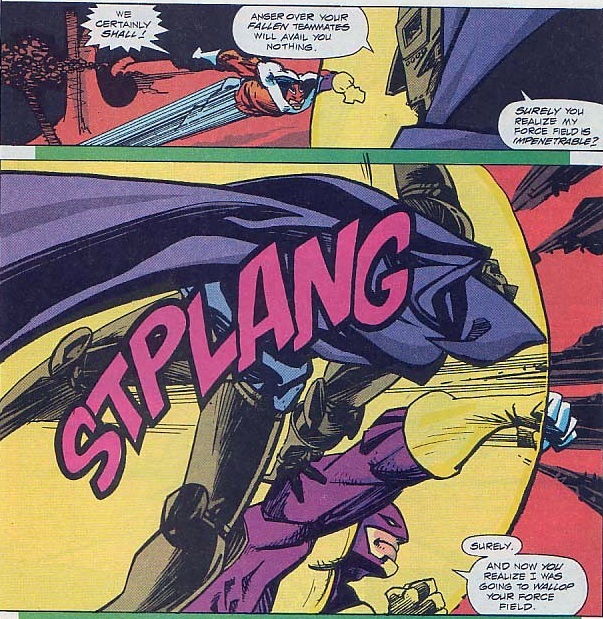 This encounter might also explain Doom’s need for revenge against Cap which he sort in the pages of Captain Britain and MI-13’s Vampire state story. Now I know that in Secret Wars the characters are supposed to not know what their lives were before they arrived in their new homes, but I wouldn’t be surprised if Dr Doom has worked a way around this. Which might explain his sentencing Jamie Braddock to certain death. Even if he hasn’t it’s hard to imagine such a mighty blow from Cap not lingering at the back of Doom’s mind, and fueling his anti-Braddock sentiments. With no sign of any Captain Britain appearances in this weeks Secret Wars comics I thought it would be fun to have a look at a past Cap crossover, the Contest of Champions. Published in June 1982 Contest of Champions was a three issue mini series written by Mark Gruenwald, Steven Grant and Bill Mantlo, John Romita JR handled the art. This series apparently has a few distinctive firsts, it’s said to be Marvel’s very first limited series, it’s possibly the first title to ever feature nearly every Marvel Character who was “alive” at the time, and may well have been the inspiration for the Marvel Universe series. I can’t validate the authenticity of these claims, but I can guide you through Captain Britain’s fairly substantial part in this series. Firstly though the plot. Every hero from Earth is kidnapped by a chap named the Grandmaster and his unknown associate – later revealed to be Death – who tell the heroes that twenty-four of their number will be chosen and split into two teams, the first to find four mystical artifacts wins the contest. With that the teams are chosen, and Captain Britain seems to be on what certainly could be the winning team. 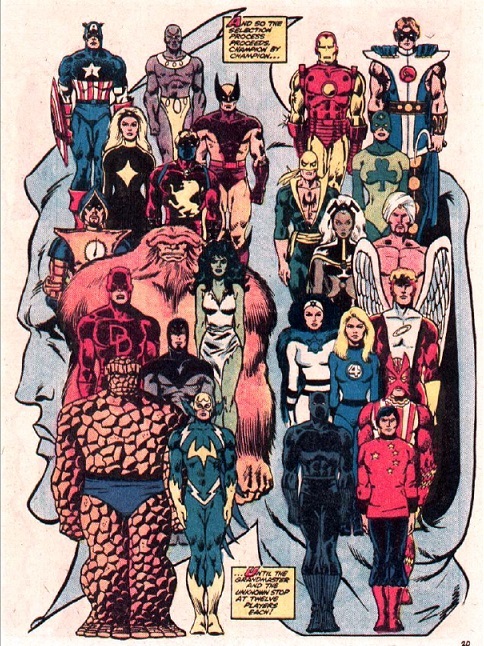 The full line up on the Guardian’s side is Captain Britain, Captain America, Talisman, Darkstar, Wolverine, Defensor, Sasquatch, Daredevil, Peregrine, Blitzkrieg, She-Hulk and the Thing. They square off against Death’s team which consists of Iron Man, Vanguard, Iron Fist, Shamrock, Storm, Arabian Knight, Sabra, the Invisible Woman, Angel, Black Panther, Sunfire and the Collective man. Studying the line up now I can say to me I’ve never seen a more diverse line up of heroes, except in Nextwave. 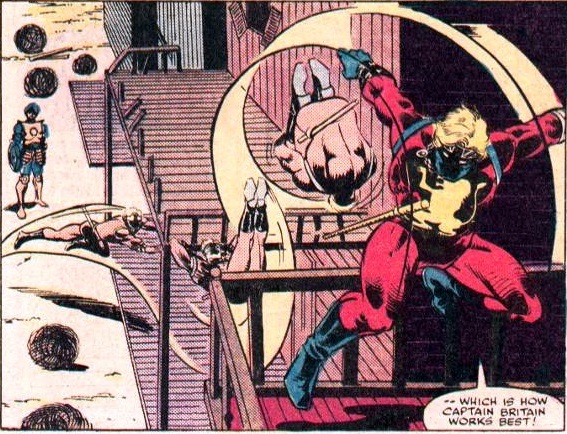 Anyway on with the contest, Captain Britain and some of his team mates are teleported to the Wild West to search for one of the missing mystical artifacts. 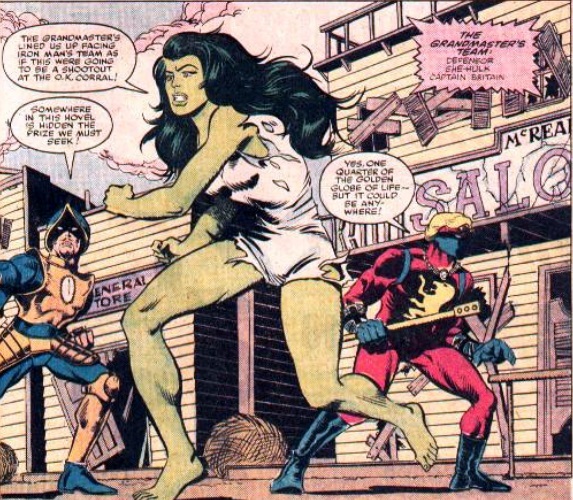 While Defensor chats up She-Hulk, Cap broods…. before setting out on his own, because that’s apparently what he does best. It isn’t long before he faces off against the Arabian Knight. Points deducted for casual racism, don’t do it again Cap. The contest ends in of all things a draw but that’s not what intrigues me about this series, but rather it’s the colorful cast of characters and the depiction of Captain Britain that draws me to this tale. 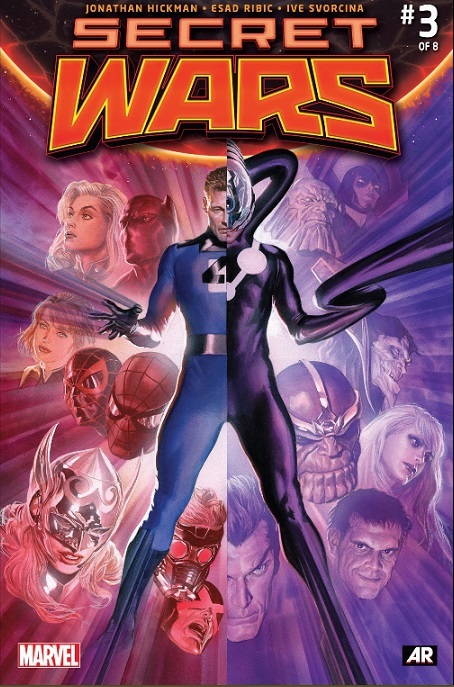 Firstly hats off to Marvel for doing a major cross over in just three issues, if this comic came out today it would be bloated with tie-in titles, spin offs and anything else Marvel could cram into its schedule. 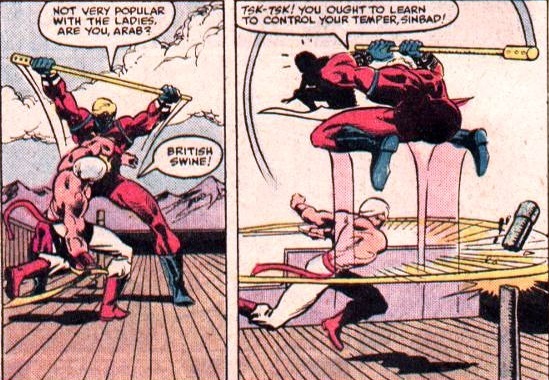 Next when I look at the story Captain Britain doesn’t really come off all that bad apart from his disrespect of super heroes from outside the UK. Sure Romita draws him with a marvelous flock of hair that wouldn’t look out-of-place on an eighties pop star, but as it’s Romita and I’m a big fan of his art I’m willing to forgive. I mean who doesn’t like his excellent kinetic depiction of Cap doing his acrobatics, which is surely the highlight of his art in this series. Plus I reckon we have Captain Britain for the UK, Sasquatch and Wolverine for Canada, Black Panther for Africa/Wakanda, Sunfire for Japan, Arabian Knight for Saudi Arabia and Sabra for Israel. So the Contest of Champions is perhaps also the first and maybe the only comic to feature an extensive line up of heroes, many of which don’t call the USA their home. So there we have Contest of Champions, a series I thoroughly enjoyed simply because it does the job it sets out to do in that lots of heroes fight each other. Sure the plot is wafer thin but name me a Marvel crossover that isn’t, the title isn’t afraid to have fun and feature some great fisticuffs with heroes who had never met before, and in some cases never meet again. Of course I’m biased as Captain Britain is in the Contest and not just for a couple of pages either, sure his appearance isn’t his best but then again it’s not his worse cross over, at least he managed to finish with both of his eyes this time. Have you read Contest of Champions, if so what are your thoughts on it ? let me know in the comments below. 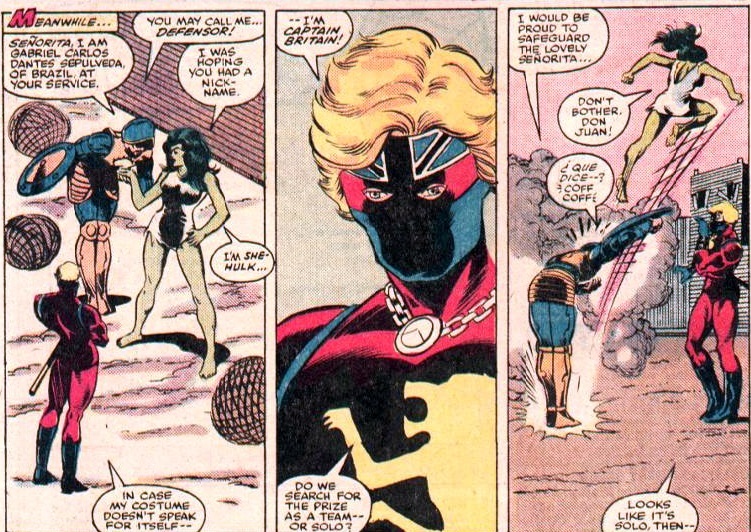 Captain Britain in Secret Wars 3 and what’s going on with Meggan? 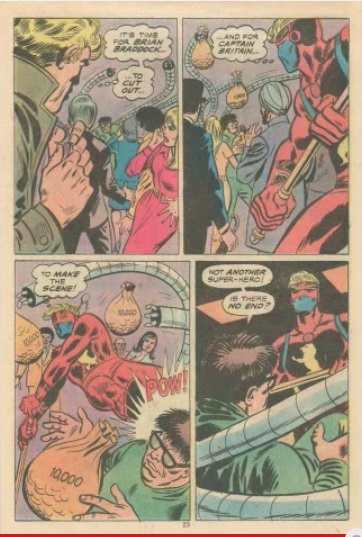 There isn’t too much to report on Captain Britain in this weeks Secret Wars 3, but thanks to eagle-eyed Blog fan Eric we do have some interesting Meggan news for you. So spoilers for Secret Wars and A-Force follow after the cover below, please don’t carry on reading if you’ve yet to read these books, and you don’t want their secrets spoiled. In what has become a regular pattern for Captain Britain after a Cap heavy story – See Secret Wars 2 – he vanishes in the next issue. 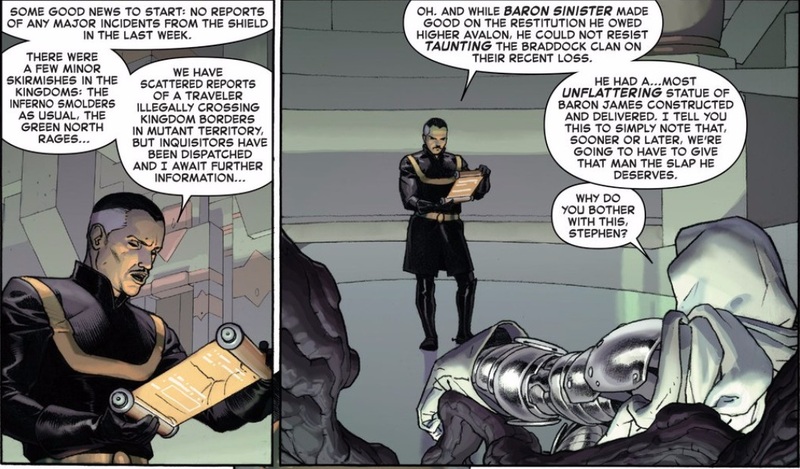 So Secret Wars 3 just mentions the outcome of his face off against Baron Sinister. Sadly we are spared the sight of the actual statue itself. 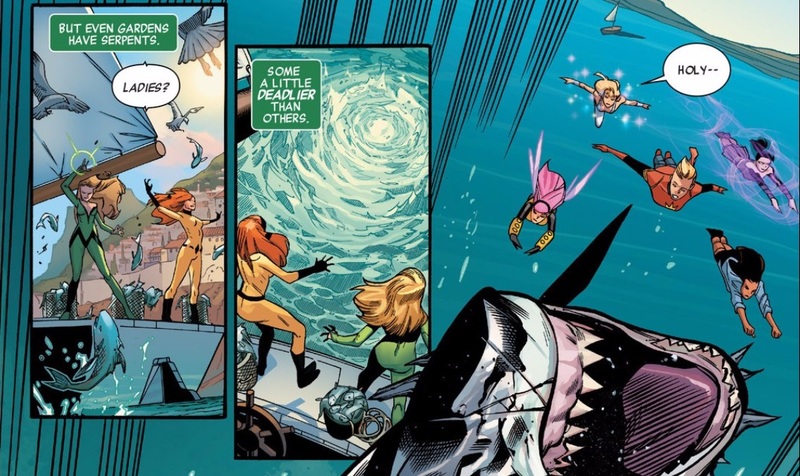 Now we are not aware of all the rules of Secret Wars and its Battleworlds, but not content to be Captain Britain’s wife in Higher Avalon another Meggan has also been spotted in Arcadia where the A-Force title is set, take a look at the picture below. While not named there is no doubt in my mind that that’s Meggan, what this means for the pregnant Meggan in Higher Avalon is unknown. Will either survive, is this Meggan a member of A-Force or is she just a bystander caught up in the action? Having a “spare” Meggan might allow Marvel to sidestep the complications for Captain Britain plot wise if he was to be a father post Secret Wars. Personally I would prefer both to survive and Cap to be caught between the two in a sit-com type comic similar to Friends – or perhaps not. What are your thoughts on the lack of Captain Britain action this week? Are there two Meggan’s and which should survive? Let me know how you feel in the comments below. 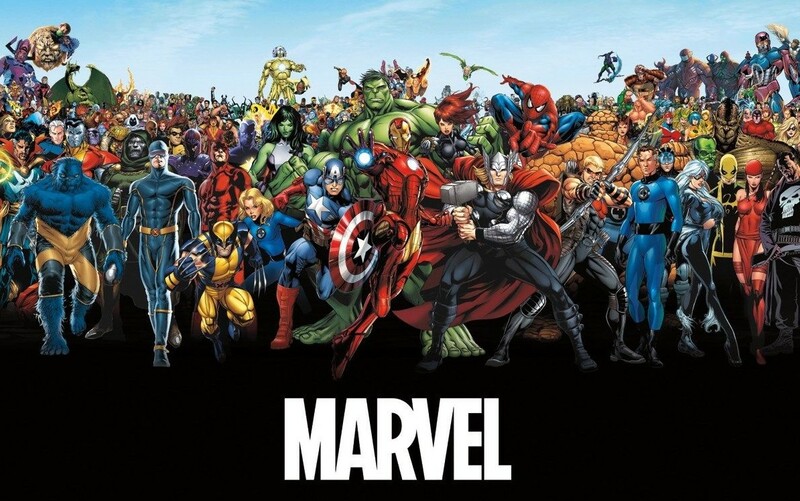 Captain Britain spotted in Marvel Line-Up poster, then he vanishes. 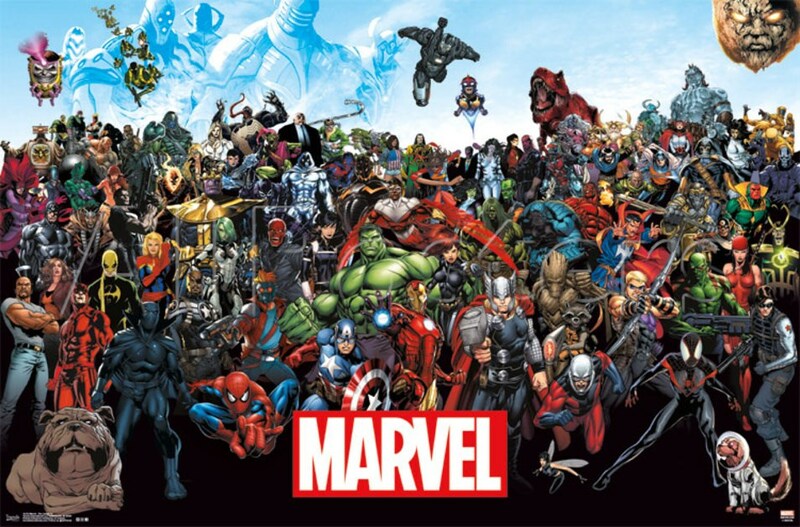 While I was browsing the Bleeding Cool comic book news website I was struck by an article which included an official poster of Marvel’s 2015 superhero line up. Why was I drawn to the poster? Well, I was interested to see if Captain Britain makes the line-up, and to my surprise there he was. See if you can spot him in the poster below. What do you mean you can’t see him, click the image to enlarge it or check out the poster below. So when the Fantastic Four and the X-Men are removed from the poster due to Marvel film rights shenanigans Cap will be safe won’t he? Click to enlarge, but I’m certain Cap has been removed from the altered poster. Why? Well it’s either because he’s in the X-Men movie or Marvel just forgot to put him back in? Me I’m betting on the latter. Thanks to Bleeding Cool for the article that inspired this post. Oh well it was nice to see Captain Britain proudly but briefly taking his place alongside the rest of the Marvel heroes. Maybe he’s still there, I mean I wear glasses so I might have missed him hiding behind Moon Knight’s cape or is he being blocked by Ego the living planet? If you can spot him in the altered poster please let me know so my faith in the Marvel merchandising department can be restored.